H591 Turkey Pen, from MICHAELIAN HOME'S Appalachian Series. 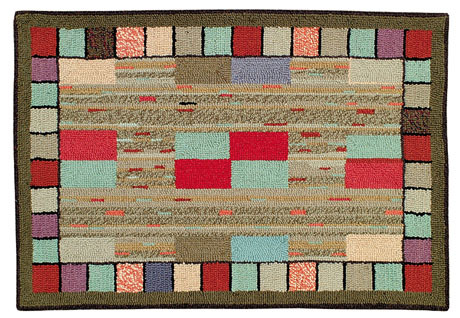 H591 Turkey Pen is a fun rug. 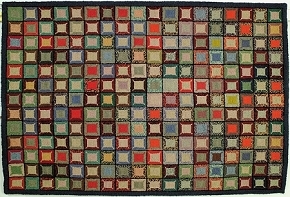 Turkey Pen is a reproduction of an Early American rug. The name "Turkey Pen" comes from the design in the field. Orginally, this type of design in the field was called "Turkey Scratch". Today this field design is commonly called "Hit or Miss". The field is Hits and Misses of colors, of Beiges, Taupes, Reds, Oranges, and Greys. 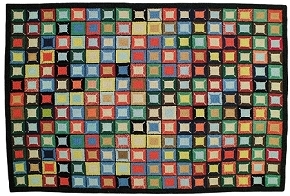 Blocks of the same colors are centered in the field and border the sides. Smaller squares of the same colors make a fun border. The rug is edged in rows of Olive Green and Brown. Turkey pen is a great rug for a high foot traffic area. Avaialbe in 2'x3', 3'x5',6'x9' and 2'x 6' runner.